A new hangout in Nantes offers guests the chance to live as a rodent for the night - complete with fur costumes and a romantic hamster wheel for two. I kid you not. "It's a unique experience and just something different. 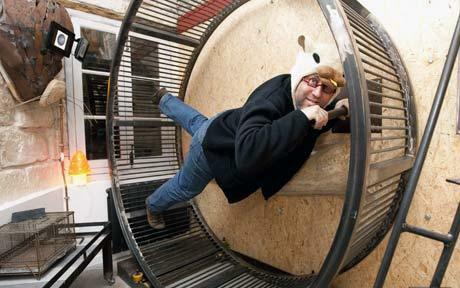 To become a hamster, eat seeds, change our way of life...come out of our daily routine. The Hamster in the world of children is that little cuddly animal. Often, the adults who come here have wanted or did have hamsters when they were small," Falquerho said, dressed as a hamster".